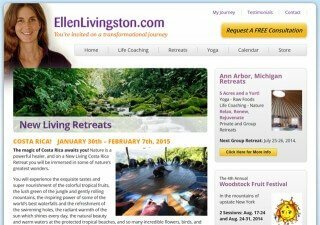 Author, coach, mentor, yoga instructor, retreat host and Woodstock Fruit Festival pioneer Ellen Livingston has been on her journey to a healthful lifestyle since the early 1980s. She is an inspiring figure who has learned to turn her biggest challenges into her greatest strengths. A knee injury suffered while skiing turned Ellen on to understanding the power of nutrition and dietary change and how food can help bring about relief and expedite healing. During Ellen’s recovery from this skiing accident, which left her in a whole-leg cast and required a year of “intensive” physical therapy, she developed a list of symptoms such as back pain and migraine headaches. Severe insomnia, clinical depression and digestive disorders soon plagued Ellen, who, at this time, began tweaking her diet and saw “limited results—enough to show me the importance of what I ate,” she said. Ellen Livingston and her children pose on a beach. Featured image photo credit by StrickfadenPhoto.com. 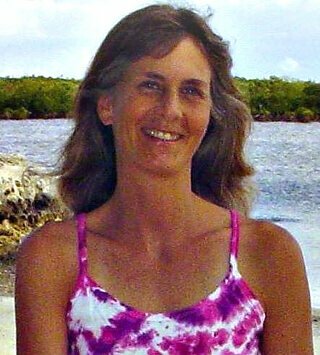 It would be another 20 years after this injury at age 18 until Ellen started her raw food journey in 2002. When Ellen, 50, of Ann Arbor, Michigan, started, she would not look back. Most digestive issues ended “almost immediately,” Ellen said. 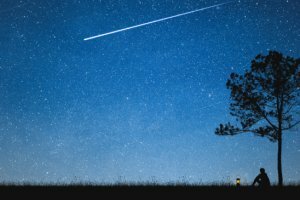 She also noticed that her sleep patterns normalized and chronic depression and migraines vanished. On a raw food diet, the only thing Ellen didn’t see heal in a reasonable time frame—five years on this diet, including a 26-day water fast—is a “badly damaged gallbladder,” she said. Ellen elected to have surgery, ending her digestive pain completely. She now experiences ease of digestion. “I have created some new life stressors in recent years—constantly playing with my learning edges!—and have been challenged to grow spiritually in order to handle strong emotions with more grace and to take full personal responsibility for all that I create in my world,” Ellen said. “I love to engage with big visions and enroll others to bring them to fruition, and in this endeavor I do create a lot of action in my life. It’s all in the service of growth and good works, and it keeps me on my growing edge all the time. Ellen said that she’s uncertain whether she’s plateaued physically yet but that she’s not yet hit her peak spiritually. “For that reason, I continue to feel more vitality with each passing year,” she said. When Ellen was 21, she discovered yoga, which she calls a “lifeline,” at a time when she was searching for “deeper meaning and understanding” while facing physical, emotional and spiritual challenges. Ellen is a registered yoga teacher, or RYT. “The magic of the ancient system of yoga helped me to make sense of my active inner world as it also helped me manage emotions and support my sensitive physical body,” she said. “Through my yoga practice I found a way to feel more grounded in my heart, and more connected in my being. Structural injuries have affected Ellen’s spine and cause chronic pain. Ellen said she makes peace with these “frustrating limitations” on a daily basis, “embracing the imperfect body” she has. “I do see the ‘blessing in disguise’ of these injuries that have shaped who I am today by forcing me to slow down and fine-tune my awareness and self-compassion and, thus, enhanced my awareness and compassion with others,” she said. 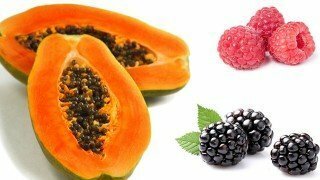 On an average day, Ellen eats monomeals of fruit or combines two fruits to make a meal. Banana smoothies are a staple for her, and celery, cucumbers and romaine lettuce hearts make a “crunchy snack.” Dates satisfy a daytime craving for denser food rich in calories, she said. In the evenings, Ellen prepares large green salads with tomatoes, cucumbers and sweet fruit such as citrus, berries or mangos tossed in the salad or blended into a dressing. She enjoys vegetables such as sweet peas, peppers, carrots, beets, asparagus and corn when they’re available in her garden. “I love to make cucumber pasta with a sun-dried tomato marinara,” Ellen said. 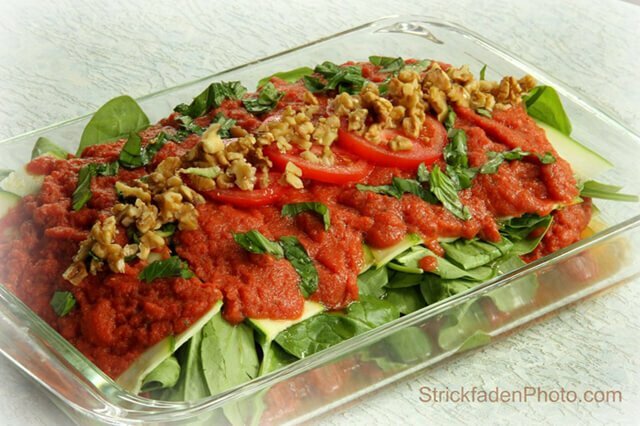 Ellen’s sun-dried tomato marinara also graces her lasagna dish. As for her intake of overt fats, Ellen eats half an avocado with her salads a few nights a week and, some other days, includes some nuts or nut butter, including tahini, in a dressing. At the top of Ellen’s list of favorite fruits are mangos, peaches, nectarines and fresh figs. Her favorite greens are romaine and butter lettuces, baby arugula and spinach. Ellen supplements with Vitamin B12 and adds Vitamin D during “long, cold, cloudy months in Michigan,” she said. She was low in both of these nutrients before supplementation, tests showed. Lately, Ellen is also exploring iodine supplementation. An iodine loading test showed a “possible issue,” she said, adding that she’s awaiting final results. Ellen said she intends to have an annual basic blood test. Transitioning raw fooders are best served by being clear with themselves about what they want and gauging how much this goal means to them, Ellen said. “This will provide the inspiration and motivation to commit to the changes you need to make,” she said. 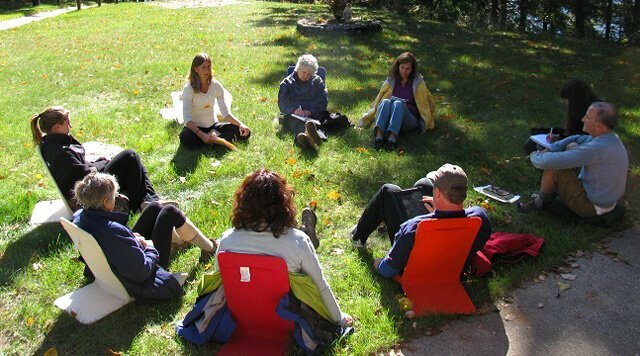 Ellen (top row in a white shirt) leads a retreat session. Ellen recommends that those transitioning consider hiring a coach or find another “raw buddy” to learn from, adding that attending raw food events and festivals such as The Woodstock Fruit Festival can fill up people with inspiration to help them on their journeys. 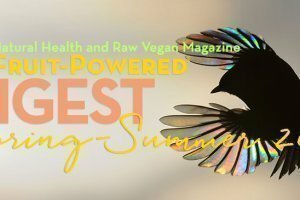 For some individuals, a high-raw diet, including whole, lightly cooked vegan foods, can help during their transition or even serve as a long-term diet, Ellen said. Ellen, who struggled to consume enough calories early in her transition, also suggests to clients she coaches to track their caloric intake. 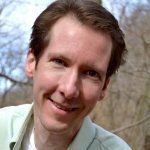 Cronometer.com is a popular free calorie and nutrient journal. “I often encourage clients to track calories for at least a few average days so that we will both have more accurate knowledge of what they are taking in,” she said. 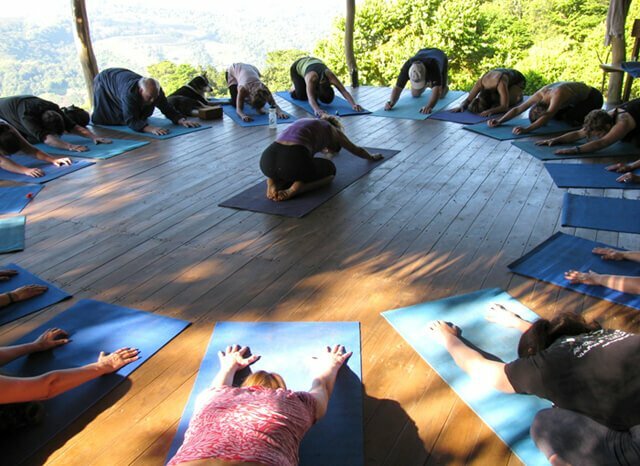 Participants partake in yoga, jungle hikes and waterfall and beach adventures. They also experience life coaching sessions, enjoy a low-fat raw food diet, with an emphasis on fruits, and get plenty of rest and relaxation. The next retreat is scheduled for January 30 to February 7, 2015, at Finca de Vida—The Farm of Life. As a yoga instructor, giving classes at her retreats and health festivals or in her 30-foot yurt at home, Ellen guides students “to connect with themselves and the bigger energy that lives through us all,” she said. 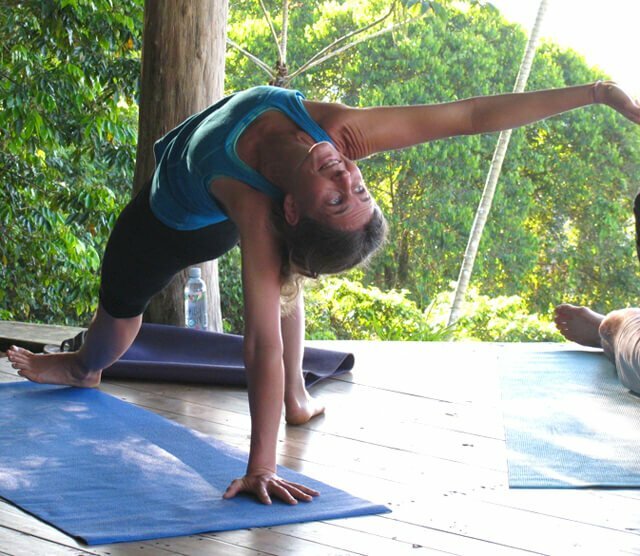 She practices a slow-flow vinyasa style that calls on students to experience the oneness of “mind, breath, body and spirit.” This approach enables Ellen to accommodate a wide range of yogi experience levels in a single class. 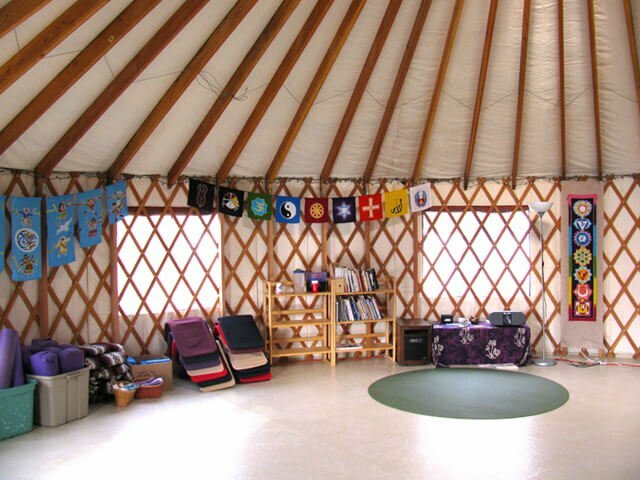 Ellen Livingston teaches yoga in this yurt in her back yard. “I like to describe practicing yoga from the inside out, creating space within the body and mind, and activating expanding lines of energy that emanate from within to create a personal expression of each asana, or pose,” she said. 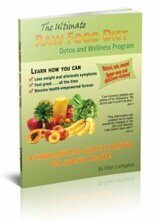 Ellen wrote her book, The Ultimate Raw Food Diet Detox and Wellness Program, to fill what she describes as a “gap” in the world of raw food literature. “I wanted to provide a condensed handbook for the low-fat fruit-based approach, something that would offer all the information I felt was truly needed to facilitate the journey in a clear, concise and attractive, easy-to-read-in-a-day format,” she said. Ellen is planning a second book, focusing on the emotional and spiritual journey and illustrated by personal and client stories. 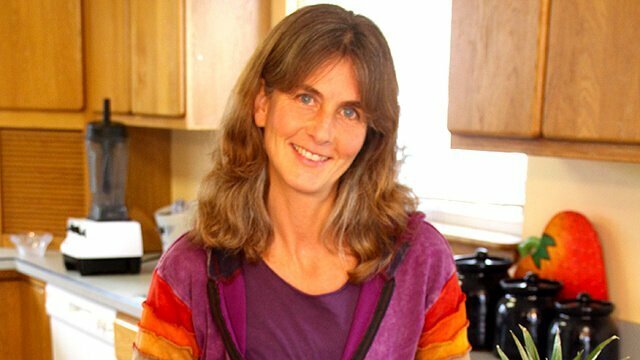 Ellen’s Simple ’n Healthy Raw Cuisine DVD shows the kind of foods that are part of a low-fat raw food diet and a range of simple recipes that can be prepared every day. 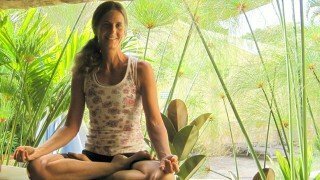 She is releasing a new yoga DVD, Living Yoga, filmed in her yurt. A decade from now, Ellen envisions herself continuing to serve others and guide them toward health and wellness through practices she makes such an important part of her life. “I imagine I will be continuously evolving my service to reflect my ever-growing wisdom about these passions,” she said. “I do intend to actively support this health movement for the rest of my days here through coaching, writing, speaking out and modeling a healthy lifestyle. Discover Ellen’s Top 10 Tips for essential wellness! Hungry for more? 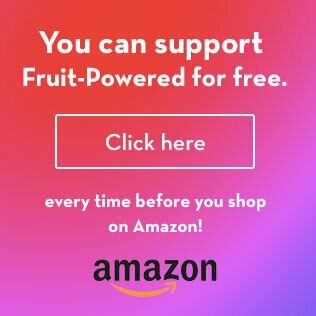 Check out Ellen’s Fruit Wraps recipe!